Intertops Poker has the perfect Christmas gifts for online casino players: Blackjack bonuses, Roulette bonuses and Video Poker bonuses! Over the Christmas Holiday, you'll get an extra bonus for designated wins like Diamond Blackjacks and Straight or Royal Flushes. They’ll give a total of $5000 in Christmas casino jackpots to Blackjack, Video Poker or Roulette players between now and December 31st. In addition to the RTG casino games in its main casino, Intertops also has a suite of casino games within its poker software. They include four types of Blackjack: Blackjack, Face Up 21, Double Draw, Perfect Pair. During the Christmas Jackpots event, a Diamond Blackjack (natural Blackjack in Diamonds) will pay an extra $5, a Small Suite 21 (6, 7 and 8) gets a $10 bonus and a Big Suite 21 (Ace, 2, 3, 4, 5, 6) pays an extra $20. There's also special jackpot bonuses for American Roulette and European Roulette. Until the end of the month, five consecutive wins with red numbers wins an extra $5 and 5 consecutive lows pays $5. Hitting every single number from 1 to 36 (even over several sessions) wins a $100 Roulette jackpot. 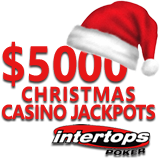 Everyone playing casino games at Intertops Poker is winning special Christmas jackpots for designated wins. Caribbean Stud, Casino Hold’em and Let It Ride and all ten of the poker room’s video poker games (Deuces Wild, Bonus Poker, Double Bonus Poker, Jacks or Better, Aces and Faces, Double Joker Poker, Tens or Better, Joker Poker Kings, All American Joker Poker Aces or The Saloon) are also paying special jackpots. A Full House pays $5, four of a kind pays a $10 bonus, a Straight Flush pays $50 to and a Royal Flush get an extra $40. Special jackpots details are available at: https://poker.intertops.eu/en/promo/85-christmas-casino-jackpot. The casino games at Intertops Poker also include a selection of real money online slots. This week the Game of the Week is Magic Quest HD, an adventurous slot game featuring heroic knights and frightening monsters. Players will encounter invincible dragons, magic rings and fearsome ogres in a medieval world. Magic Quest HD is a wide screen, high resolution game with mythical cartoon graphics.